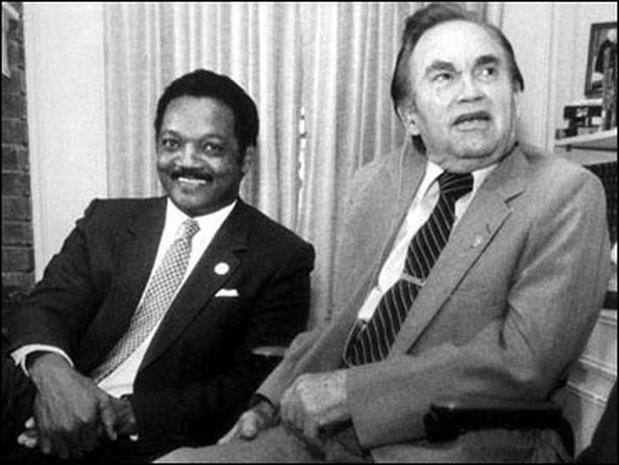 Several years following the 1972 assassination attempt upon him in Maryland, he campaigned for, and won re-election to an unprecedented fourth and final term in 1982 while wheelchair bound… and with the broad support of the African American voting community in the state, without whose support political researchers at UAB have said he would not have won. Wallace experienced an epiphany moment, a genuine change of heart motivated by a faith / religious conversion experience, and made an unfeigned heartfelt and genuine apology – which was believed and accepted – to the same group whom he once used as a political tool for his own selfish ambition. But good, bad, or indifferent, his infamous “stand in the schoolhouse door” is today what he is largely remembered for. 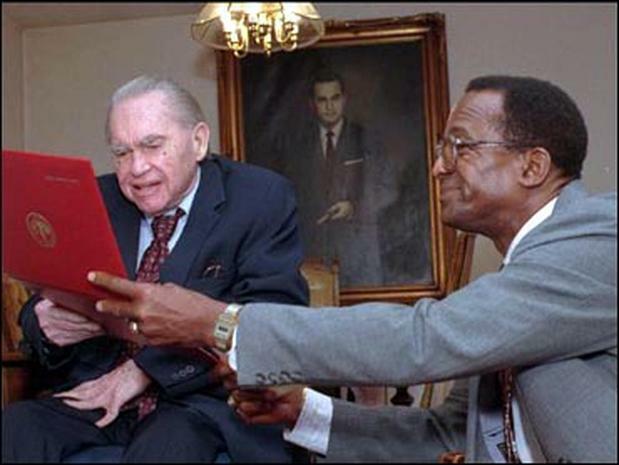 Yet there was much more to the man than that, and in a memoir, his son George Wallace, Jr., has shared that privately, his late father was genuinely repentant about his earlier politically expedient deeds. 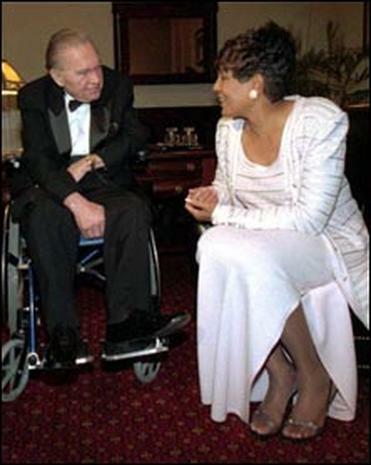 Wallace meets with Vivian Malone Jones before she receives the first Lurleen B. Wallace Award of Courage Thursday, Oct. 10, 1996 at the State Capitol in Montgomery, Ala. Wallace tried to keep Jones from attending the University of Alabama in 1963. Two towering figures in our nation’s history, George Washington and Thomas Jefferson also owned slaves. Should we throw that baby out with the bath water? Tomorrow, next week, or next year, the popular consensus about other matters now considered socially acceptable or reprehensible will undoubtedly change. Who will that dragnet catch then? 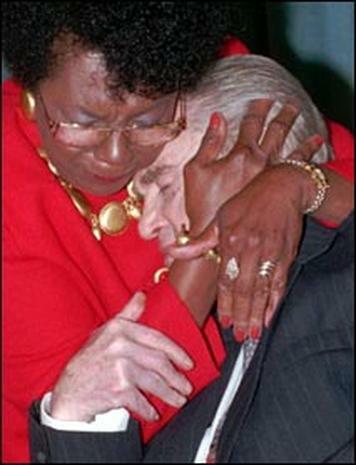 Of course, I don’t know about anyone else, but I can’t identify either of those two characters in the photo. Can you? Considering also the source of the image – by a cohort of well-known radically extremist GOP operatives with validated white supremacist ties to Steve Bannon and thrice disgraced Alabama jurist Roy Moore – that itself speaks volumes. And the Virginia Governor’s track record similarly speaks for itself. History is much more complex than many make it out to be, and people and times change. But the frothing churning waters of our 24/7/365 modern corporate global news media still need a dead horse to beat, and now they have another one. This entry was posted on Monday, February 4, 2019 at 12:15 PM	and is filed under - Did they REALLY say that?, - Faith, Religion, Goodness - What is the Soul of a man?, - My Hometown is the sweetest place I know, - Politics... that "dirty" little "game" that first begins in the home., - Read 'em and weep: The Daily News. Tagged: Alabama, Democrat, George Wallace, governor, history, photo, racism, Ralph Northam, Virginia. You can follow any responses to this entry through the RSS 2.0 feed. You can leave a response, or trackback from your own site.